Verifiable industrial scale is made of stainless steel and has a separate display. This verifiable industrial scale has IP 67 protection against dust and it is also water resistant (it is possible to sink the industrial scale into water up to 1 meter without any damage). You can use water to clean the industrial scale, so this scale is ideal to be used in wet areas. Industrial scale is powered by a standard 230 V/12 V.adaptor. 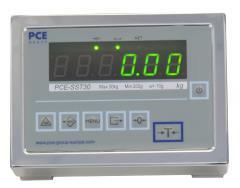 Water resistant scale comes with embedded RS-232 interface. By means of the optional software, weighing data can be transferred directly to a computer. To meet ISO standard a calibration or a verification can be performed when the scale is ordered (for an extra price) or it can be done by any authorized laboratory or by your local authorised verification centre. Here, you will find an overview of all our industrial scales. - Water resistant stainless steel platform with embedded weighing cell. IP 67 protection against dust and water. - Indicator/display with IP 65 protection against dust and water. - Piece counting function with pre-established quantity: 10, 25, etc. Verification (only for those devices, that can be verified) can be done when the scale is ordered or as a reverification. Once an official verification has been done the scale cannot be recalibrated using an external calibration weight. The first verification is valid for two years, but every other verification is valid for one year and must be done annually. For those companies which want to include the industrial scale in their tools for control or anual recalibration. ISO certificate comes with a laboratory certification with all the measuring values. The name and details of the company or the customer can be included in the document.